So the family and some fine people from the west coast finally got Charlie on a plane and to California for the first time ever! Thanks to everyone at the Golden State Pinball Festival for the hospitality and hosting us at what is an incredible show. We also managed to sneak in 2 days of vacation at Disneyland (thanks to a great friend) and went to Las Vegas for more work to make sure Spooky Pinball LLC has some cool product coming your way for the next several years to come! You’ll get interviews from the show, road reports from the family, a visit from E.M Dungeon dweller James, and Danni will tell you all about how to navigate the classic horror game Tales From the Crypt! Yet another Total Nuclear Annihilated prize from Pinball Life tops off what is the 99th consecutive monthly podcast for team Spooky. Make sure you come back next month for something special on our 100th episode special! 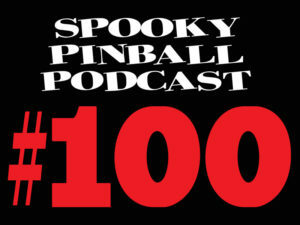 Back once again to thrill, chill, and hopefully entertain you is the one and only Spooky Pinball Podcast. We’re off to the Midwest Gaming Classic this month to … get a little weird really. Nothing like hanging out with Svengoolie and playing pinball! You’ll hear from several guests from the show, and you’ll also get a nice interview with Dom & Chris from Newcastle Pinball / Pinfest IN STUDIO! Yes, all the way from Newcastle, Australia to Benton, WI just for your listening pleasure. Toss in the usual great prize from Pinball Life, The E.M. Dungeon, and Danni giving you the run down on Taxi (Wms pinball) and you’ve got something anyway! Enjoy. We’re off to the Texas Pinball Festival, and holy leaping pinballs what a weekend! The Alice Cooper’s Nightmare Castle reveal went so well it was scary, and Scott Danesi’s Total Nuclear Annihilation game continues to pile up the awards. This time Scott landed the Pinball News 2017 GAME OF THE YEAR trophy! Congrats to Scott as always, and thanks to Martin for the trophy! We’ll talk all about the TPF adventure, the road trip down and back, the new game, and prepping for the Midwest Gaming Classic in just a couple weeks. Also this month we’ll hear a new segment from a special young gal who just might teach you a thing or two about pinball rules… Danni Peck from New Zealand. 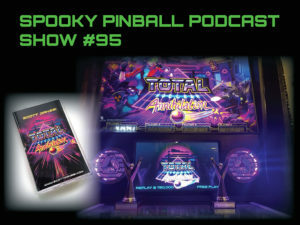 Toss in the usual goodness of prizes from Pinball Life, the EM Dungeon, and some weird stuff you’ll have to hear for yourself and you’ve got an April shower of pinball goodness. 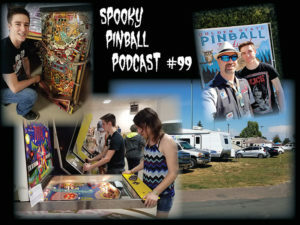 A show 8 years in the making… on this episode of the Spooky Pinball podcast we have the usual banter between Charlie and Bug, and bring in Robert and Jay from Double Danger Pinball to discuss the coolest pinball paraphernalia purveyor on the planet! Pinball Life is giving away a super set of interior graphic protectors (they really work, we use them here in production even!) Our Spooky Pinball Twitter master, Bug is stepping it up a notch and bringing you some fun and funny new goodness, and of course we have the usual cast of characters to hopefully keep you entertained and who knows, maybe even a little informed. Flip away pinball people! As Spooky Pinball the company starts our 5th year of business, we move the podcast 1 show closer to 8 years of goofy pinball entertainment. As Total Nuclear Annihilation moves closer to our all time sales record, we bring back Scott Danesi to share some stories and talk all about the process that went in to making something incredibly rare… an entire pinball game soundtrack available to the masses! Plus, its been released on cassette (it’s Scott, go figure) as well as all your favorite steaming services. We’ll also hear from E.M. Dungeon Master James Willing, as he takes up his normal SLOT with a slight deviation (all pun intended). We’ll even be giving away a TnA cassette to a lucky listener just for fun, courtesy of Pinball Life! Kick back, put your flippers up, and enjoy the random banter. 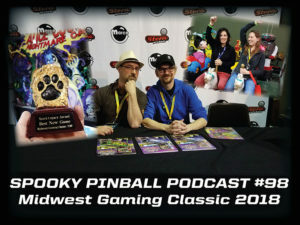 It’s 2018… and the worlds longest running pinball podcast is back for our 8th consecutive year! This month, Bug and KT are taking over the show while Charlie is off chasing a Bunyip. You’ll hear from our Aussie animator while your hosts go over the wildness that was 2017 and give you some sneak peaks into what’s planned for the upcoming year. Toss in the usual generosity of Pinball Life, and you’ll have the gift that keeps on giving the whole year Clark. 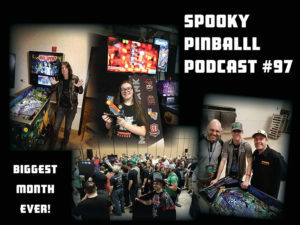 Welcome to 2018… Spooky Pinball Podcast style! Ladies and gentlemen, flippers and butts up for the one, the only, Jack Danger! 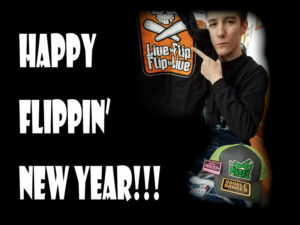 Jack and his often on air cohort Krystle join us this month for a little back story on Dead Flip and some flippin’ fun! 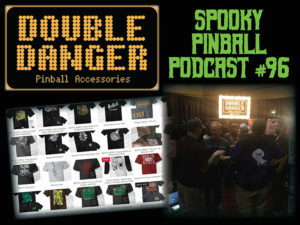 You’ll also get the usual amount of Spooky madness with Bug & Charlie, hear about the long overdue Spooky Pinball Twitter goodness, get the EM Dungeon… and if that wasn’t enough, you’ll get not 1 but 2 free prizes this month! The big one being some Meltdown Mirrors from Pinball Life for your Total Nuclear Annihilation. Did we mention they’ll be free to 1 lucky listener??? Merry New Holidaymas everyone!!! Yep… it’s Halloween (or was yesterday) at the Spooky Pinball LLC world HQ, which means … lots of weird things! Bug and I decided to mix things up by playing a game of stump the horror movie pinball nerd, Terry from Pinball Life is giving away a cool Total Nuclear Annihilation prize, and of course the E.M. Dungeon master is back for another episode. 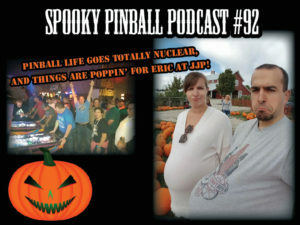 Returning once again to the Spooky Pinball podcast is Eric from JJP. Eric will be discussing the incredibly well received new Pirates of the Caribbean game that appears to have made some serious waves in the pinball industry, ON HIS FIRST GAME!!! What is it with these young pinball designers these days?! Speaking of which, we’ll go over the Total Nuclear Annihilation launch party (see, another young designer!) and talk about all sorts of spooky Halloween goodness. Tune in, turn on, and get spooky loyal listeners! It’s the 2017 Halloween Spook-tacular! We are celebrating our favorite holiday this year with the one and only, Matt “Piggy D” Montgomery! Matt is the bassist in Rob Zombie’s band, and also handles guitar and vocals with Ash Costello in our favorite spooky Halloween Party Monster band, The Haxans! Matt is also the composer of lots of new music you’ll get to hear soon in the Alice Cooper’s Nightmare Castle game, so we’ll talk pinball with him and we’ll even give you a sneak listen of this fantastic new music on this months show. You’ll also get the 2nd part of the interview with 99 year young pinball legend, Wayne Neyens. Toss in a great prize from Pinball Life, lots of little spooky things, and you’ll have a blast listening to this months offering. Stay Spooky Creepy Kooky pinball people!